The aim of this lectures timetable was to discourage the absence of professors and students and to make a good impression on the world with the Leiden scholarship. Pretty soon after the founding of the Leiden University, on the proposal of rector Justus Lipsius the board of governors decided to draw up annually a series, also called a catalogus or ordo lectionum (a timetable of the lectures), one for the summer months (March - October) and one for the winter months (November - February). The aim of this timetable was to discourage the absence of professors and students and to make a good impression on the world with the Leiden scholarship. Copies of it were sent among others to the book trade fair in Frankfurt. 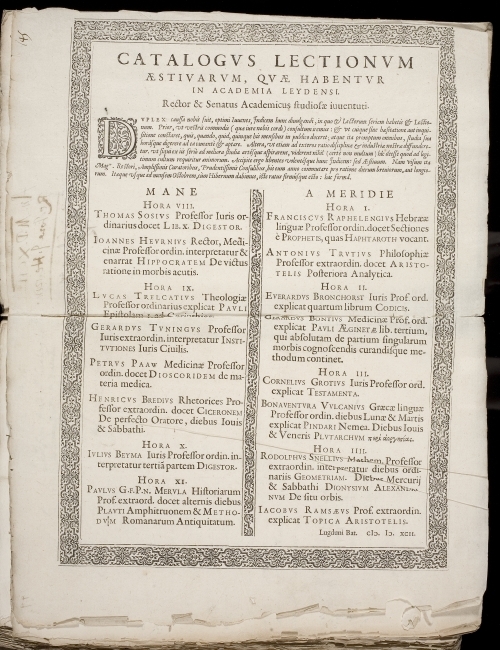 The oldest preserved printed series lectionum dates from 1592 and concerns the summer months. The lectures are enumerated to the hour and the professors are mentioned according to the hierarchy of the four faculties of 1) theology, 2) law, 3) medicine and 4) letters, at first the ordinary (ordinarii) and then the extraordinary professors (extraordinarii). So we can see that the professor of theology Lucas Trelcatius treats the first epistle of St. Paul to the Corinthians at nine o'clock in the morning and the professor of law Everardus Bronchorst the fourth book of the Codex at two o'clock in the afternoon. They did so on all four ordinary days for lectures: Monday, Tuesday, Thursday and Friday. Wednesday and Saturday were reserved for disputations, examinations and private lectures of the professors. Sometimes a professor treated two subjects in one semester, for example the professor of Greek language Bonaventura Vulcanius the Nemean Odes of Pindar on Monday and Tuesday and on the two other days one of the Moralia of Plutarch. Such a series lectionum gives information that can't be found elsewhere, for example about which subject was treated by a certain professor in a certain year. Moreover, we can follow the changes in the course of time of the subjects, the works that were treated and the definitions of the disciplines. In the Library of the Leiden University copies of the series lectionum have been preserved completely from 1654 up to the abolition in the sixties of the twentieth century. Sometimes a hitherto unknown older copy emerges, like the one from 1613 bound in a catalogue of the Library of the Leiden University from 1612, sold at Sotheby's in London in 2008.